The Kuiper Belt has been in popular science news this week as Hubble Space Telescope images of Pluto revealed a fourth moon in orbit around the dwarf planet. “P4” (still awaiting a better name) is the smallest moon discovered around Pluto with a radius of roughly 20 km. A paper published on the arXiv this week reveals fourteen other new Kuiper Belt Objects (KBOs) found using ground-based imaging in the Southern part of the sky. Most of the prior large surveys for KBOs had been in the northern hemisphere using the Palomar 48-inch telescope and led by Mike Brown at Caltech (who, by the way, has an interesting book out called “How I Killed Pluto and Why It Had It Coming”). These surveys found dozens of KBOs, a number of which were deemed big enough to get nice names, like Eris, Makemake, Haumea, Quaoar, and Sedna. However, until recently the southern sky did not have a comparable telescope and instrument for sensitive wide-field surveys. 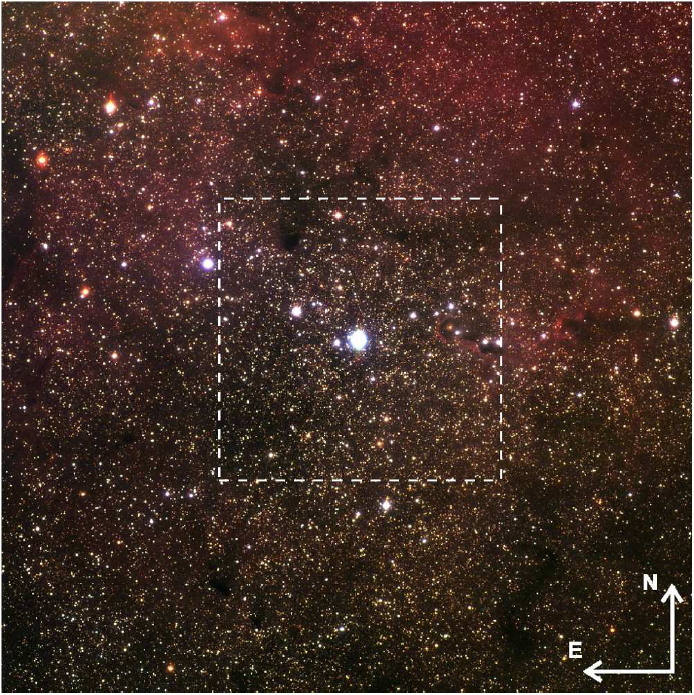 This KBO survey, which covered 2500 square degrees of the sky, was made possible in 2009 when a large wide-field imager was installed on the 1.3 meter Warsaw telescope at Las Campanas Observatory in Chile. It covers a region of the sky that complements the regions already covered by Brown et al.’s prior surveys, focusing on regions of the southern sky within 40 degrees of the ecliptic. 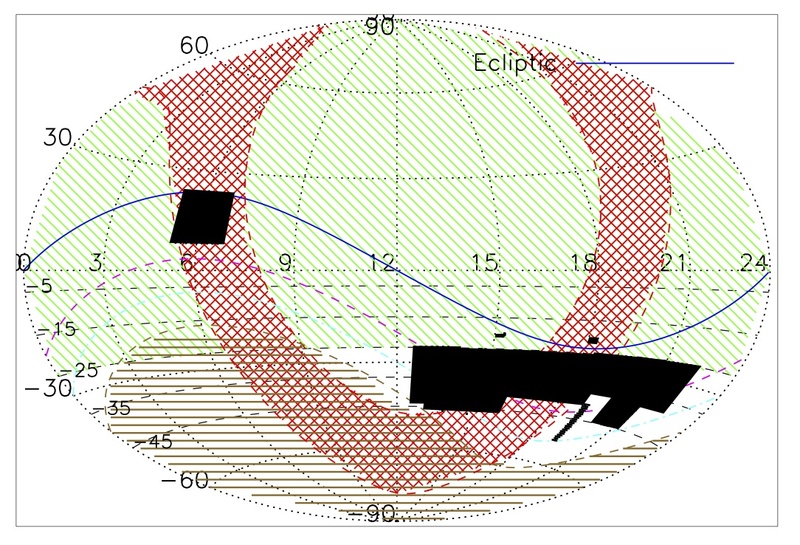 A map showing the regions of the sky covered by each survey is shown in Figure 1. The black regions show the sky area surveyed in this work. The green regions were surveyed in previous surveys. The red hashed regions are within 15 degrees of the galactic plane. The blue line shows the ecliptic, and the pink, cyan, and brown dashed lines represent the -20, -30, and -40 degrees from the ecliptic respectively. KBOs in the survey were found using their proper motion across the sky. An image of the same field of view was taken three times in a single night, with the first and last image at least two hours apart. Two different algorithms were used to find the Kuiper Belt Objects, which move between 0.5 and 4 arcseconds per hour against the background stars. The first algorithm is designed to detect motion of objects that would correspond with an object orbiting outside of Neptune’s orbit. The algorithm keeps track of the positions of each object in the field, and can determine if one object moved between observations. The second algorithm is a novel method, especially useful in the crowded fields near the galactic plane, called a differencing technique. The images from different times in the night are “subtracted” from each other. 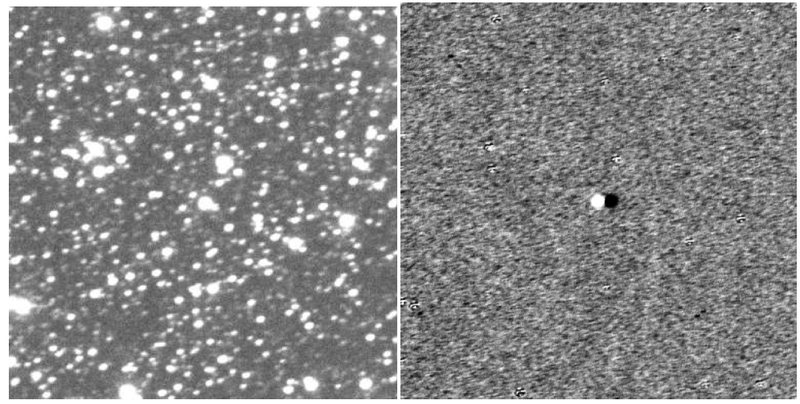 The background stars all stay in the same place over the course of the night and “cancel out” in the differenced image, but an object in the Kuiper Belt will move by a few arcseconds, appearing as a dark spot and corresponding light spot. An example of this technique using an image of Pluto in a crowded field of stars is shown in Figure 2. The figure on the left shows an image of Pluto in a crowded field, close to the galactic plane. The figure on the right shows the same field of view after the differencing technique is applied. Note that Pluto appears as a dark and light spot as it has moved across the field in the hours between observations. Using these techniques, the survey is able to detect objects with magnitudes in R-band (red visible light) of about 21.6 magnitudes or brighter. The differencing method for detecting KBOs makes this the first survey to be sensitive in the region of the sky where the ecliptic of the solar system crosses the plane of the galaxy. The authors observed eighteen objects in the survey, fourteen of which had never been seen before. Combined with the previous work in the northern sky, the Kuiper Belt is now expected to be nearly complete down to objects of about 21st magnitude in R-band. The fourteen new objects range in apparent magnitude in R-band from 19.5 to 22.2, corresponding to radii from about 50 km to about 310 km. Radius measurements of KBOs are uncertain because of variability in albedo, or surface reflectivity, but assuming a moderate albedo, three of the new objects are larger than 200 km. This means they are big enough to be in hydrostatic equilibrium and thus to be classified as “dwarf planets” like Pluto and Ceres. Much like the asteroid Vesta, as a protoplanet relic, can teach us about planet formation, the Kuiper Belt is considered to be a remnant of the original protoplanetary disk that formed the solar system. By learning about the population, orbital structures, and compositions of the largest objects in the Kuiper Belt, we can learn about the solar system formation and evolution. You mentioned P4 again, Pluto’s new little moon. I’ve suggested Minnie, of Minnie Mouse fame, associated with Micky and Pluto for many years now. But nobody has taken any notice. Thanks for the article on the Kuiper Belt.